My new favorite party trick is to pull out my iPhone, and use it to turn on the irrigation for my new lemon tree. The crazy thing is that I can do this even if I am 5000 miles from home. Admittedly I am kind of showing off, because the irrigation schedule is automated, and I don’t need to fuss with it. The tree is already getting all the water it needs. We run a Smart Home automation system in our 1907 Craftsman. Meaning that we can control and program most of the lights, switches, locks, fans, heating, video cameras, security systems, cooling, weather station(! ), etc. remotely. My geeky network engineer husband is responsible for getting us into the world of home automation. 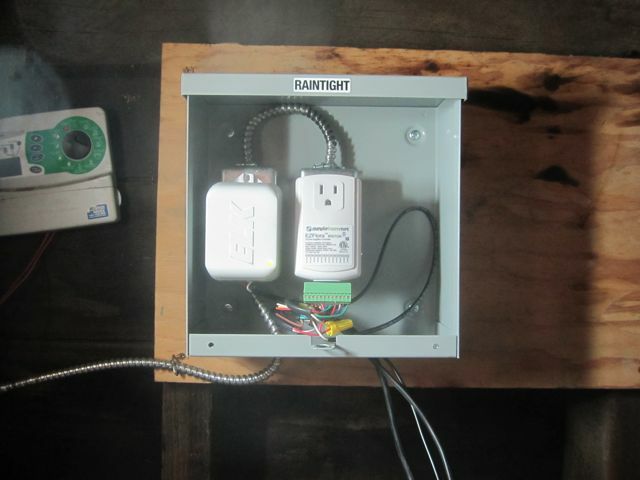 We started with light switches about 4 years ago and slowly added more automation to the house and other buildings on the property. So when we decided to redo the landscape in the front yard we knew we should add the irrigation to our Smart Home system. The drip irrigation valves we used are DIG Irrigation DM075 Automatic Valve Assembly for Drip System.Â They are discontinues at Home Depot, but you can buy them online at Smart Home and Amazon. They are pretty cheap (approx. $25.00 each) and we have had good luck with them. 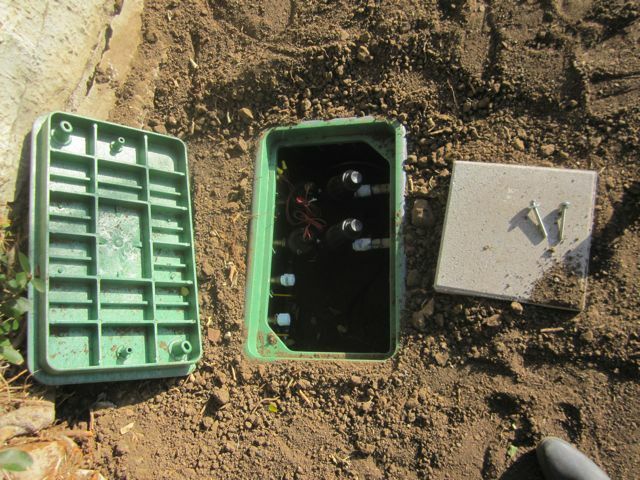 The green irrigation boxes (that protect the valves) are from Home Depot. The (4) valves (above) control my fruit trees, shrubs, raised beds (with edibles) in the west side of my front yard. + Soon I hope to have one of them controlling the drip on my (6) hanging baskets on the porch. This irrigation box (above) is in my pumpkin/squash patch that I call the “farm”. One valve controls water in the farm and a second controls shrubs on the lower terrace. For now (2) additional pipes are capped off (white caps in photo above). Eventually they will be used to run drip under my small lawn. But we are not going to replace the lawn until all the other major construction is finished. It seemed like it would be a good idea to run the extra copper pipes now, so that we would have some expansion room when we need it. 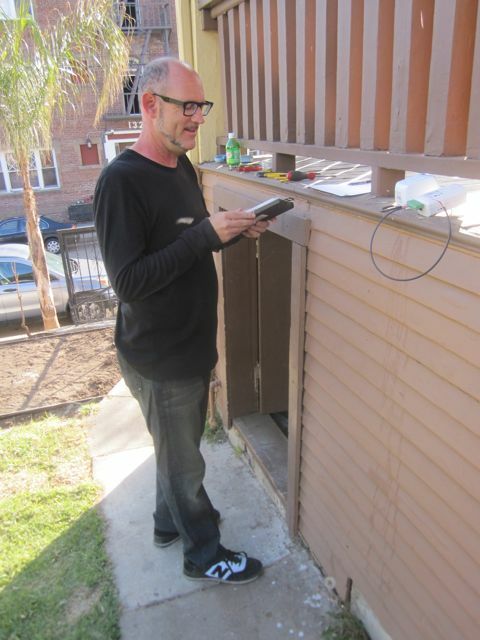 Here is Jonathan (my husband) helping me test and adjust the new irrigation system. 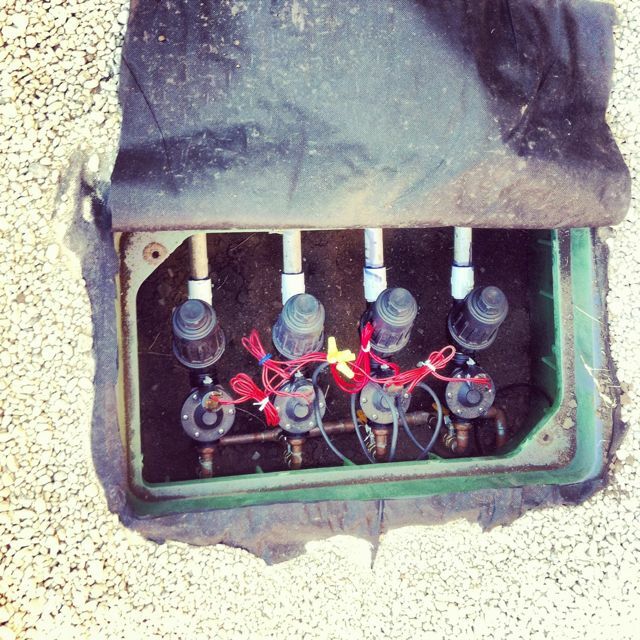 We are using a SimpleHomeNet EZFlora #5010A to run the valves in the front yard. We also bought a second one to run the valves in out backyard. It is compatible with INSTEON or any X10 controller. 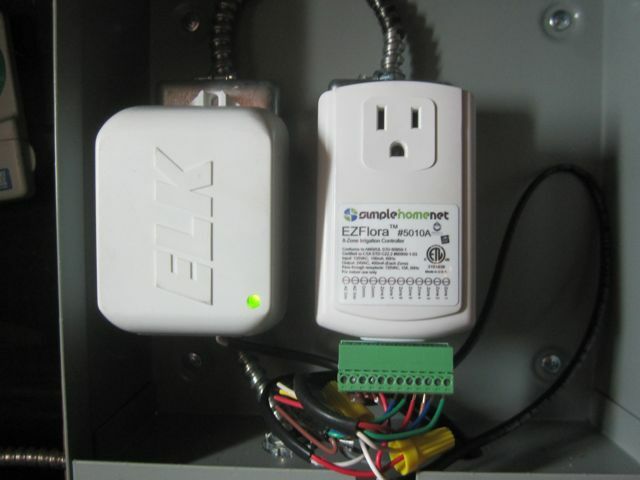 If you are not already running some time of Central Automation Controller (to control your whole house) you will need to get one. See Smart Home for more info. The irrigation controller is located under our porch. We had our contractor mount a piece of plywood to the wall, and then a water tight box I bought on Amazon. The electrician installed 2 outlets inside the box. So all we had to do was plug in the two devices and connect the low voltage wires that lead out to the valves in the yard. We had to make a little diagram so we knew which wire led to which valve. Since there were only 6 new valves it was easy. We also added our old sprinkler heads for our lawn to the new smart controller. We got the system up and running very quickly. There were a couple of leaky connections that I had to call my plumber back out to fix. But for the most part everything worked as expected. After you get the valves working you need to run drip line (tubing) to the plants. I’ll cover how to do that in a separate post. In the meanwhile, here is a link to another post where I talk about drip in raised beds. The basics are the same. Anyway, it was such a relief to get the drip working! It’s great to know that when I am busy or out of town the garden is getting watered properly. Want more technical info on setting up smart irrigation system?